Manuel is a minimal tropical storm south of the Mexican coast. It is likely to strengthen slightly before landfall. The main threat from Manuel will be from flooding rainfall. Rainfall amounts of 10-15 inches are possible with heavier totals in the mountains. As of 2 am pdt (5 am edt) Manuel was centered near 15.3 N / 102.4 W or about 285 miles SSE of Manzanillo, Mexico. Movement is stationary. Top sustained winds are estimated at 45 mph (NHC 45 mph / 2 am pdt or 5 am edt advisory). Pressure is estimated at 996 mb. Manuel is along the coast just under hurricane strength. The main threat will be from flooding rainfall. Water levels will remain high near and south of where Manuel has made landfall. Power outages also will continue where winds are generally stronger than 50 mph. As of 5 am pdt (8 am edt) Manuel was centered near 18.2 N / 103.3 W or about 85 miles SE of Manzanillo, Mexico. Movement is stationary. Top sustained winds are estimated at 70 mph (NHC 70 mph / 5 am pdt advisory). Pressure is estimated at 985 mb. Manuel will slowly drift along the west coast south of Manzanillo gradually weakening. 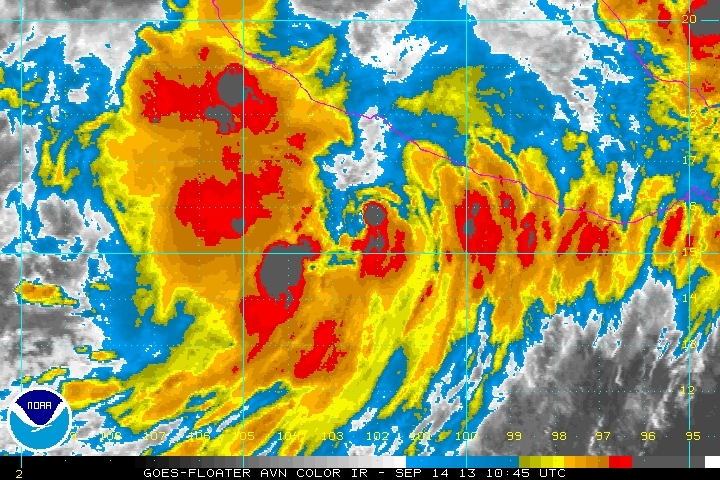 The remnants of Manuel are reforming southeast of Cabo San Lucas. It is expected to regenerate and become a tropical storm. Manuel is forecast to drift north toward Cabo San Lucas. Manuel is restrengthening in the southern Sea of Cortez. An eyewall is forming and it is likely that Manuel will become a hurricane before landfall. 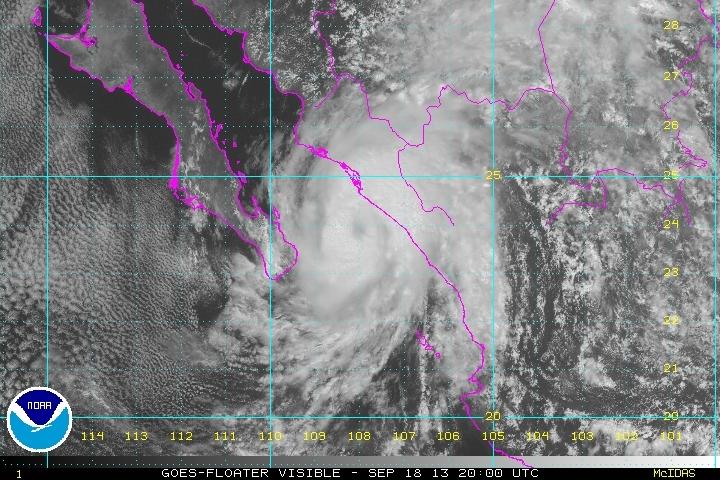 It is rare to see a hurricane in the Sea of Cortez. 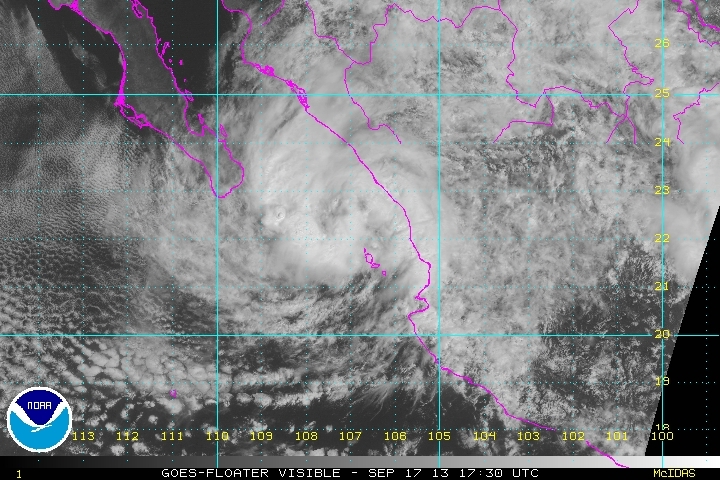 As of 2 pm pdt (5 pm edt) Manuel was centered near 23.9 N / 108.1 W or about 120 miles WSW of Mazatlan, Mexico. Movement is stationary. Top sustained winds are estimated at 70 mph (NHC 70 mph / 2 pm pdt advisory). Pressure is estimated at 988 mb. Manuel will make its 2nd landfall by later tonight or tomorrow morning at the latest. Heavy rainfall and storm surge where Manuel make landfall will be a concern. Preparations to protect life and property should be completed by dusk tonight. 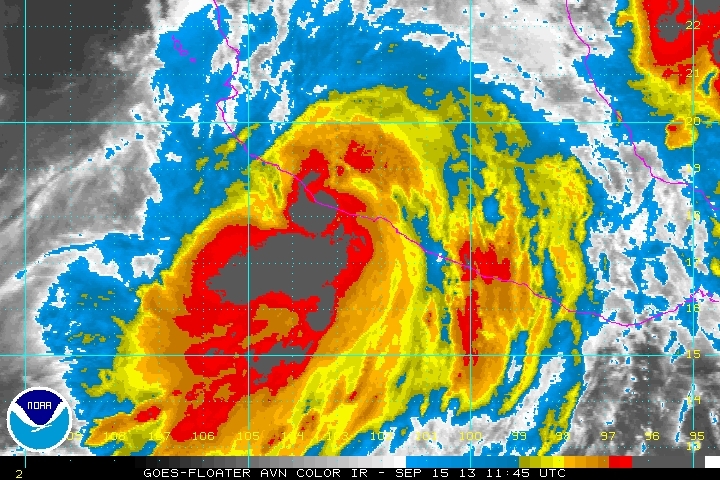 Manuel is making landfall between Culican and Mazatlan. Winds and surge will gradually weaken today. Heavy rainfall will continue with the threat of flash flooding. I believe that the hurricane force winds have already dropped, so my sustained wind estimate is lower than NHC's. As of 2 am pdt (5 am edt) Manuel was centered near 24.8 N / 108.2 W or about 20 miles NW of Altata, Mexico. Movement is north at 3 mph. Top sustained winds are estimated at 65 mph (NHC 75 mph / 2 am pdt advisory). Pressure is estimated at 987 mb. 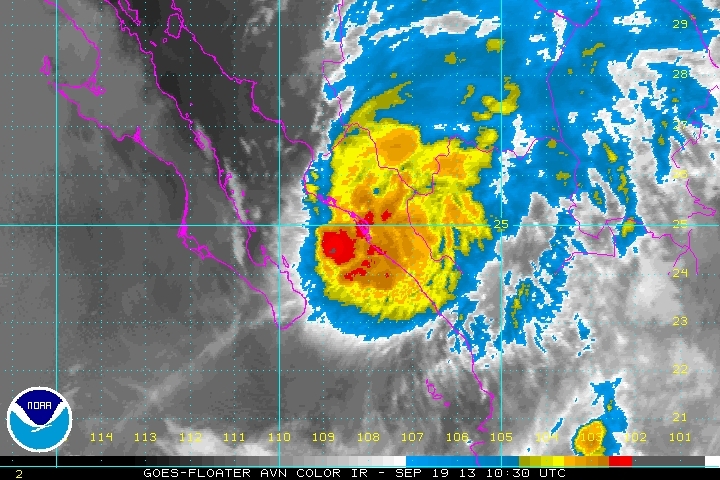 Manuel will continue to move inland between Culican and Mazatlan today.